42 is also YOU! Thank you Jackie Robinson…. For my son’s birthday, all he wanted was to spend the day with his best friends at the movies. Now, I’m a party-planning fanatic, so of course I had to do more than just the movies. Although I tried to keep it simple, I planned a fun lunch at a nearby diner and had several cans of silly string and a case of foam ninja swords waiting for them when they came back to the house to continue the party. By no coincidence, he started his birthday at the baseball field where he helped his team win 17 to 12 and although he is a great outfielder, he usually connects every time he is up to bat and it was an exciting game for the team. By the time he arrived home, the house was decorated in TMNT (Teenage Mutant Ninja Turtle) fashion and I had arranged for a lunch at a fun diner close to the movie theatre. 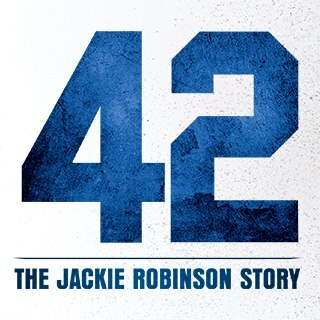 His first choice of movie would have been Iron Man but since it wasn’t out, he opted for 42, the Jackie Robinson story. I thought this was a pretty brave selection for an eleven year old to make, especially living in the burbs and knowing that half of the birthday crew were of the lighter persuasion (or light brown, as my son used to say when he was a toddler!). He didn’t even think as I did, that the blatant racism and ignorance depicted in the movie would possibly make some of his guests uncomfortable, but that’s because he knows his friends and I must say, he chooses wisely. He’s had the same best friends since he was two and a half and in Montessori school, and they have been close companions ever since. Regardless of color, they love each other and enjoy their commonalities without a thought of their differences and that’s why I think it was the perfect movie choice to celebrate their long-time friend and their nearly nine-year friendship. I have to admit at first that after reading the reviews and other comments from social media, I wasn’t sure if it was going to be an authentic portrayal of the man and the era in which he lived. And although the story seemed to focus a lot on Branch Rickey, you were also invited into the heart and soul of Jackie Robinson; his frustration, his anger, his intelligence, his passion, his intense love for the game and the warm and trusting relationship between him and his wife. The movie took you on a journey from the stench of racism in the guts of the deep south through the climax of Jackie leading his team to the World Series, and it was a roller coaster of emotions for me in-between. I was angered, I was appalled I was saddened, I was elated, I was happy, I was ecstatic, I felt proud and mortified and finally brought almost to tears of joy. Not once did I look at my watch (other than when one of the kids asked) and not once did I think to myself that Chadwick Boseman, was not the real Jackie Robinson. I love just about anything that Harrison Ford is in, and although odds are against Mr. Boseman, I pray that they will both be nominated for an Oscar because both are worthy. I grew up hearing stories of segregation from my father who was a few years younger than my son when Jackie Robinson made history, and I know there are so many stories that America has yet to tell of that time, but for me that doesn’t discount the importance of this story. The movie was packed with so many life lessons and every child, caramel, cocoa or vanilla needs to see this movie so that this world can change. We’ve come a long way, but there are still those even today who are holding on to the hate, fear and ignorance of their ancestors. It’s been quite some time since I’ve seen a true story that made such a lasting impression on my soul. I walked away with what we all want bigots of all colors to know and that is that we are all worthy of the opportunity to live, love, play and pursue our dreams without the roadblocks of racism, ignorance and hate in our way. I sat there during the movie in awe of the undeniable courage, grace, faith and constant support it took for him to stand his ground and refuse to be pushed from the game that he loved so much. I think that his perseverance was often taken for granted by those on the outside looking in, and although the burden was mostly his, it was clear from this story that he wouldn’t have been able to stand so strong and so firm without the help of those surrounding him who believed in him, loved him and admired his strength. I love that his number is the only one retired on every single National baseball team and that they all wear his number 42 on April 15th, the day he first started with the Dodgers to signify that we are all 42. We will all at one time or another in our lives come up against adversity, fear, hate, shame, defiance and jealousy and when we do, how will we handle it? Will we realize that our effort is for the greater good? Will we think at that moment about the children decades ahead who will look to us as a role model and one day want to tell our story? Will we give up, thinking it’s just too difficult, or do we lean on our support and push ourselves up and refuse to be defeated? It’s haunting to think what would have happened if Jackie Robinson had given up. What would that have said to all of those who for their own reasons were watching? I know that I for one am thankful that his widow did not give up on making sure his story was told on the big screen. It may not be as exciting as Iron Man, but as my son said “it was the best birthday ever”! Thank you Jackie Robinson, for your legacy of determination and for never giving up. You are not only a hero, but a superhero in my eyes. This entry was posted in Recreating yourself and tagged 42, Chadwick Boseman, determination, Harrison Ford, Jackie Robinson, Perseverance, Racism, The Jackie Robinson Story. Bookmark the permalink. 2 Responses to 42 is also YOU! Thank you Jackie Robinson…. 42 was like the Ray of baseball. If it influences a young kid like Ray did me, your so could be the next J Roll. Great gift superhero momma! Thanks so much for reading and commenting Supreem!